In her work, Anna Pekkala (b. 1989) deals with the differences between animals and human beings. Her pieces often have an ecological ethos and their tone is controversial. 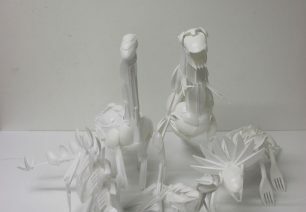 In this exposition we will be seeing small sculptures that are made of everyday materials that we all know. Last summer Pekkala’s sculptures raised interest at the Mäntyharju demolition building exposition, and next summer we will get to see them at the Mänttä Art Festival. The exposition will be open at ARTag Gallery Studio from February 9th till March 4th. Welcome to the opening party on Thursday, 8th of February, at 5 p.m.! At the same time there will be the opening of Teemu Mäenpää’s exposition on the gallery side of ARTag.